Kendall is an expert writer currently working for a Dissertation Writing Service firm. She likes to help students who seek guidance in their career. Other than work she likes to read books and novels. People love apps, and they’re spending every day searching for them. According to Vision Mobile, global economy, in 2016 alone, has peaked up to $143 billion. With the number of smartphones being circulated around the people, chances are high that at the very least half of them will buy apps. With over a million apps to search from, what are the chances that anyone will come upon yours? People every day are searching for apps. With over a billion smartphones revolving around the world, the odds are very great that people will buy apps. Ankit Jain, the ex-Head of Search and Discovery for Google Play, stated that there are 12% of active daily users of the play store. 50% of people search for apps at least once a week. 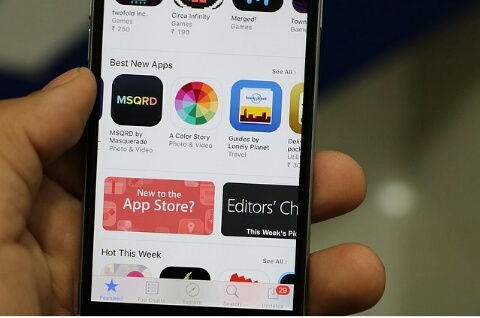 According to Apptentive, around 63% of people browse the App Store to discover new and trending apps. People not only find out about apps via social media and word of mouth but also search for them themselves. Like SEO is to the web, ASO is to apps. ASO, or App Store Optimization, is generally crucial for you to ensure your app stays in the limelight. The more visible your app, the higher will be your ASO ranking. There are a few things to ensure your app stays on top of the search list, and there are a few false beliefs and myths which people are going to affect their ranking. I’ll discuss some of them below. Why would you want to keep changing the name of your app? No, it does not keep your app fresh. In fact, when someone tries searching you up by your name, they won’t be able to find you because you’ve changed the name of your app. Title are actually very important, and creating and recreating them can hurt your ranking. Many people might try to look up your app because they heard about it from someone. How difficult will it be to find it if you keep regularly changing your title? So just come up with a good title before launching your app, and leave it at that. There are a few things you should know about coming up with a good title. For one thing, it should be creative and unique, because they’re the types which people remember because of their difference. Do not make your app name a variation of a famous app, as that does not go well. Making your app name different can also ensure that people can search them easily, and they’d wield fewer results, increasing your chances to be on the top. When people are choosing which apps to look at from a long list, they’re not going to spare a second of their time to open your app if it doesn’t catch their eye. Why should they, when they have so many other apps offering and showing things in a better way? Make sure that the title you keep is short and to the point, and fits in one screen. It’s inconvenient when the title is half hidden and I have to go on to the next screen just to view it. Chances are high I just won’t bother, and so will a lot of people. Why let all your hard work go to waste just because you’re too lazy to write a description? It won’t take long to describe your app, and attach a couple of screenshots with it. Give people an insight of your app and convince them that they should download it, and it’s exactly what they’re looking for. When you launch a new product or service, don’t you take out time and effort to market it? Otherwise, people would just be unaware of it and you’ll be losing a lot of potential customers. So keep in mind that describing your app should not be something spare but should actually be given importance. Downloading stats play a crucial role on your ranking algorithm so adding an attractive and creative description to persuade the pursuers to download and choose your app over your competitor’s. Don’t kill all your efforts and hard work done in building the app by throwing away the opportunity you get to describe and market it. Use your keywords wisely, as they are a double edged sword. They’re incredibly important and useful because it eases the search for the users, displaying things they are actively searching for. It’d be very helpful if a keyword is kept in a title and increase downloads. But stuffing keywords everywhere is also incredibly annoying and create a negative image towards your app. Fit keywords as naturally as possible. Keeping them in your title and description works only as long as it fits the context you’re writing. The ranking is certainly not more important that keywords because search results for apps are also displayed on Google, but you need to be incredibly careful how you use them as well. Don’t think you can just sit back and enjoy the magic after you upload your app. You need to be serious in your efforts to make sure that your app gets recognized, and it takes a lot of downloads to do so. It’ll not fit in or naturally find its own way without any effort on your part because don’t forget that you’re up against typically millions of apps, and many of them are your competitors. You need to promote your app through regular means, like ads in social media and pop-ups. Pop-ups are certainly very annoying, but they inflict in people’s minds that your app exists, so use them in a good way. This is where I break it to you; ratings are not as important as you have been led to believe. You think that just because each other app stops your game or task in the middle to ask for a rating, it’s probably very important for ASO ranking. Truth is, it just creates a good impression, and impressions only count so far. As I stated before, you need many downloads to get recognized and boost your ASO ranking, and rankings are there to create an impression to future potential customers to consider your app based on user experience, and that’s it. High rankings are the perception of users, and they do not depict the App Store ranking, and they do not necessarily depict the success rate of an app. Notice that some of the top ranking apps like Facebook, Messenger, and Whatsapp don’t have as high a ranking as you’d believe. So as you can see, high rankings alone do not voice the success of an app. To keep your app standing up and healthy, it’s necessary to plan a good digital strategy and calendar before it’s launch, so you’d know what to do and when users can expect an update. The distribution and other aspects of publication need to be planned out and people will see that you gave your app a lot of love, care, and thought. While the rules I stated above certainly do matter, in the end, it’s about what your customers think, and what part they play in building the reputation of your app. Either they can throw in a good word on social media, or tear it down, taking away your future customers as well. So make sure you build a good user experience and have a strong customer service to answer queries and cater the needs of your customers.